Lio was born as Wanda Ribeiro de Vasconcelos in 1962 in Mangualde, Portugal. In 1968, she and her family moved to Belgium. She debuted in 1980 with the single 'Le banana split', a hit in Belgium and France. 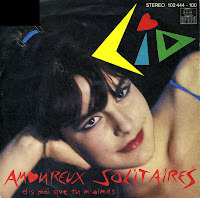 Her second single, 'Amoureux solitaires' also made it to the singles chart in the Netherlands, reaching number 3 in the Dutch Top 40. While her career continued in Belgium and France, she never made the Dutch chart again. I didn't like 'Amoureux solitaires' when it came out, it was only a decade later, when I started discovering music by other French artists like Laurent Voulzy and Mylene Farmer, that I started to rediscover it. The first time I bought the single the sleeve contained a wrong disc. I should have paid more attention! About six months later, I was more successful.